Whenever I have mentioned that my ancestors came on the First Fleet, the usual reaction of people is disbelief – How do you know? Its 200 years ago. Well the fact is until about two years ago, I didn’t know. I had always known that my maternal grandmother’s family were among the first people in the bush in Tasmania, but it was a telephone call from Hobart from a cousin, of whom I had never heard, that aroused my interest. She rang enquiring if I knew how the Devereux family came by their money, as she was doing a family history. Devereux was the family name for generations. Well, I knew they had plenty, but how they got it I didn’t know. Of course, you know, she said, our family came on the First Fleet. So after many telephone calls to and from Hobart and letters containing information flying over Bass Strait, I decided one day that I would put all this information down on paper, for future generations to marvel at. Where the money came from, and, more importantly, where it went, is still unknown, so I have attempted to solve this baffling problem by putting all the facts together, and writing my story. Enlisted in the Marines in 1785. Volunteered for service with the First Fleet and came out in the Friendship 1788. Took his discharge in 1791 when his term of three years service with the First Fleet expired and settled on a grant. Re-enlisted in the New South Wales Corps on Norfolk Island on 23 December 1801. He was still serving in September 1809 when the Description and Succession Book for the New South Wales Corps was written. The Marines were soldiers who were specially trained for fighting at sea. The founding regiment had been set up in 1644 to produce the type of soldier whose capacity to fight was not diminished by debilitating effects of land and arduous voyages. The Marine Corps counterparts in today’s army would be the commandos. Private John McCarthy was my great-great-great-grandfather and, for the record, I will refer to him as Papa McCarthy. Also the Friendship was Ann Beardsley, aged 21 years, sentenced at Derby on 5 August 1786, for having in her custody a black satin cloak and other goods the property of Elizabeth Woodhead and which were feloniously stolen out of her dwelling house in April 1786. Sentenced to five years transportation, Ann shared with one other convict woman the distinction of having the lightest sentence of all the Fleet. However, in August 1787, when the Fleet was at Rio de Janeiro, Lieut. Ralph Clark, of the Marines, who kept a most interesting journal, records that he supervised the transfer of six of the women convicts from the Friendship to the Charlotte (Ann Beardsley was one of the six) as a reward for being so well behaved and received in return six of the worst from the Charlotte, which did not make him very pleased, as according to his journal, things were just about out of hand aboard the Friendship. It is certain that John McCarthy and Ann Beardsley met aboard the Friendship and their friendship certainly blossomed into romance as is evidenced late on. When the Fleet reached Table Bay (South Africa) all the women convicts were taken off the Friendship and transferred to other ships and sheep were taken on. Lieut. Ralph Clark could not contain himself and wrote. Thank God, we have got rid of the ‘damned whores, the sheep are a lot less trouble, and swore an oath that he would never set foot on a ship again, if ever there was a woman on it. The Baptism Book of New South Wales, Vol.1, Entry No. 48, records that on March 1, 1789, at Port Jackson, in the County of Cumberland, New South Wales, in the presence of His Excellency, Arthur Phillip, Esq., Governor, the daughter of John McCarthy, a marine, and of Ann Beardsley, a convict, was christened Harriot Beardsley. That baby was my grandma’s grandmother. Governor Phillip made sure that everyone attended the church services and also that all babies were christened, but for reasons that are obvious, no marine was allowed to marry a convict, but this did not prevent some long-lasting liaisons from being formed. Among the Officers of the Fleet and the Marine Corps, many men such as Philip Gidley King, Surgeon White and David Collins had children by convict women. They did not desert these children, but, of course, were unable to marry, as difficulties would have arisen, as some would want to return to England when their term of duty expired and would be unable to take their wives, as some were transported for life. Now, Papa McCarthy, in his capacity of marine, showed very good sense in getting himself stationed on Norfolk Island in June 1789. Remembering he had become a father in February of that year, presumably Ann Beardsley went with him. The more decent types among the convict women attached themselves to one man for protection, particularly one of the soldiers. 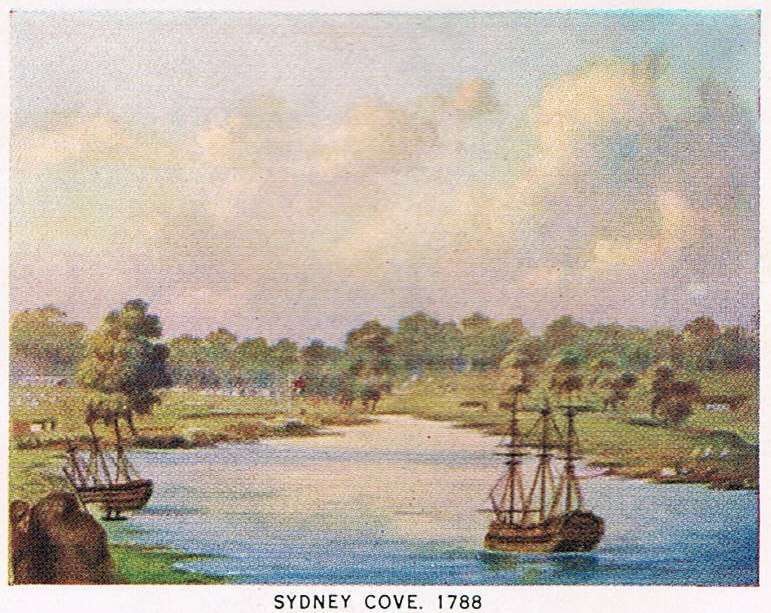 Because of the dreadful starvation in the settlement of Port Jackson, the population was equally divided between Sydney Cove and Norfolk Island, with approximately 500 at each settlement. Land at Norfolk Island was much more fertile than around Sydney Cove and soon supplies of food were able to be sent back to Sydney, where the situation was desperate. We will now leave Ann and John with baby Harriet on the peaceful pacific paradise of Norfolk Island under the competent command of Lieut. Philip Gidley King, later to become Australia’s third Governor. It was during the second settlement of Norfolk Island 1825-1855 as a severe penal establishment that paradise turned into Hell! There were no women convicts on the island in these years and the brutality of the guards and the punishments inflicted are best forgotten. The scene now shifts to the Emerald Isle, where trouble is brewing in the Land of Saints and Scholars, with the ancient and noble family of Devereux becoming involved. But Devereux you might well say is a French name and you would be quite right. The Devereuxes came to Ireland with the Anglo-Norman invasion in 1170 when Richard de Clare, second Earl of Pembroke, known as Strongbow, landed at Crook, near Waterford, with 200 knights and 1000 soldiers. Their conquests laid the foundation of English rule in Ireland. After Pembroke’s death, Henry 11 of England claimed Ireland for his own son, John, and later English kings considered the country part of their domains. The Devereuxes were the wealthiest and most powerful of all the Strongbowain race in Wexford, writes Dr E Hogan, noted Irish historian. So, it is ironic that some 600 years later, a Devereux would be fighting to regain Ireland’s freedom and independence from England! 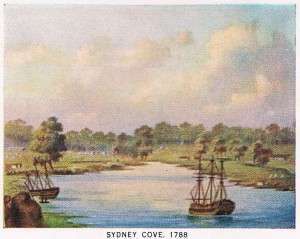 Sentenced in Cork in 1799 for his part in the 1798 Rebellion at Vinegar Hill in Wexford, but not transported until 1801, John Devereux is clapped in irons and arrives in Sydney in 1802 on the Atlas, one of the hell ships so named because of the indescribable conditions in which the prisoners were transported. Most of the prisoners were young, high-spirited Irish rebels, and amongst the boys from Wexford was one, Thomas Meagher, himself the son of the Lord Mayor of Waterford, transported for life, as were all the captured United Irishmen. “General” Joseph Holt, an Anglo-Irishman, who got himself involved in the Irish cause, was also transported with them. John Devereux, no doubt, would have been involved in the Irish uprising at Castle Hill in 1804, when they mutinied and charged the military with pitchforks and scythes with the battle-cry Death or Liberty and a ship to take us home. Well we know the result – several were hanged and John Devereux, along with “General” Joseph Holt and other leaders of the uprising, were despatched to Norfolk Island, where it was considered they had less chance of doing any harm and no chance of escape. We are now back on Norfolk Island and it is a moonlit night, November 1807. A young couple can be seen strolling hand in hand along the beach. Yes, John McCarthy’s daughter, Harriet, is now 18 years of age and has fallen madly and passionately in love with – you guessed it – John Devereux, who we presume, is working for her father. Papa McCarthy has become an established settler described by Philip Gidley King as a very quiet and well-behaved marine settler, a very peaceful man. Papa McCarthy also had the distinction of being on the list of First Settlers in Australia, having been granted 60 acres on Norfolk Island in 1791. He also had re-joined the military as a Resident Member of the NSW Corps. Although an Irishman himself, one can assume that Papa McCarthy would not be too pleased to have an Irish rebel as a son-in-law, as he was apparently well-in with the authorities. Harriet, now pregnant, arrived in Hobart Town on the HMS Porpoise in January 1808, on the Second Embarkation of the population of Norfolk Island. 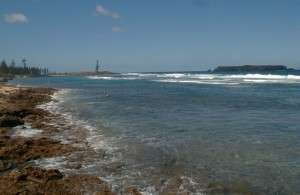 This of course, was during the mass exodus from Norfolk Island to Van Diemen’s Land. The British Government had decided that Norfolk Island was an expensive and not very useful little settlement, as the Norfolk Island pine was found to be too soft for ships’ masts and the flax not suitable for sails. So, in 1805, the Home Office decided to abandon it and transfer its population. This was a slow business, taking some years to effect. On the Fourth Embarkation, the schooner Estramina arrived in Hobart Town on 5 June 1808, carrying John Devereux with a remark against his name – A reference to Headquarters for this man’s time, his conduct merits my perfect approbation, no doubt written by Captain John Piper, the Commandant of Norfolk Island at that time. Lieut. Governor Colonel Collins must have seen fit to grant him a conditional pardon, as he is on the records as coming free to Van Diemen’s Land. The pardon, of course, would have been granted on the condition that he never return to Ireland. The two young lovers were united in holy matrimony by the Rev. Robert Knopwood at St David’s Church of England, Hobart Town, on 13 June 1808, and the darling baby girl was born to them in August 1808. The baby was also called Harriet. Papa McCarthy arrived in Hobart on 3 September 1808, to find that he was now a grandfather. The shipping list of the Fifth Embarkation on The City of Edinburgh shows no wife or other children accompanying him – so what happened to Ann Beardsley? Did she die? Marry someone else? Or go back to England a free woman, having paid her debt to society and cleansed of her sins? Did she leave her child with Papa McCarthy to rear, as Harriet was named on the shipping lists as Harriet McCarthy? All now settled down peacefully in the beautiful valley of the Derwent River at New Norfolk, Van Diemen’s Land, under the command of Lieut. Governor David Collins, himself a First Fleeter, having been Governor Phillip’s right-hand man. 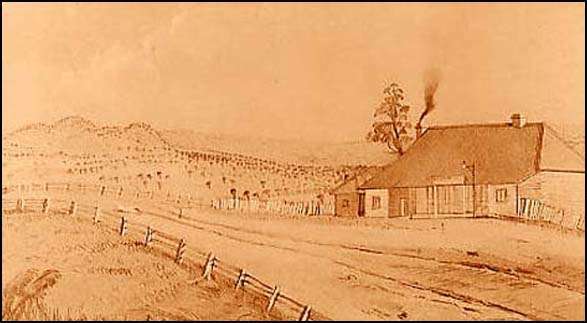 John Devereux was granted 65 acres in accordance with the instructions for granting land to ex-convicts; 30 if single, 50 if married, and 10 more for each child. Papa McCarthy was granted 80 acres in the same area. 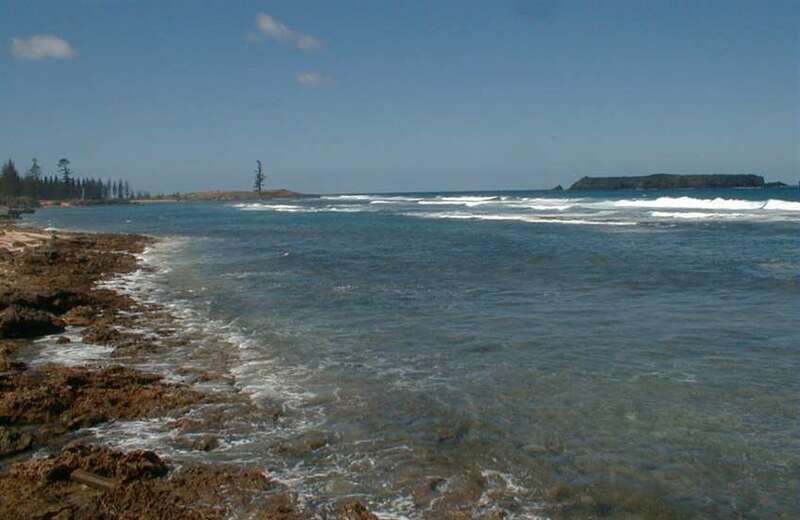 This grant was in compensation for land relinquished by the grantee at Norfolk Island. 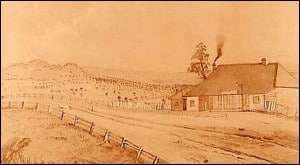 Mr Phillip Devereux, Hotelkeeper and Orchardists, Port Cygnet, was born at North Bridgewater, near Hobart, in 1820, and is a grandson of the late Mr John McCarthy who was a pioneer of New South Wales and Tasmania, and died in Melbourne. Mr Devereux’s father was a farmer at North Bridgewater. In 1847 Mr Phillip Devereux settled down in business in the Huon district, and has been engaged in fruit-growing for many years. He has 23 acres under fruit adjoining the hotel at Port Cygnet, 20 acres at Irish Town, and another orchard at Lymington South. As proprietor of the Huon Hotel for the past thirteen years he has been very successful being careful always to pay that attention to visitors which the most exacting expect. Opposite his well-known hostelry is his large entertainment hall. Mr Devereux is identified with all local affairs, and was for many years a member of the Port Cygnet Road Trust. He married Miss O’Rourke, a native of the district, and has a family of sixteen children. When aged 80, he was featured in the Tasmanian papers when he showed great courage in the 1898 bush fires near Cygnet. Mr Phillip Devereux, of Orielton, late of Port Cygnet, was probably the oldest native-born Tasmanian. His father settled in Norfolk Island at the beginning of the 19th century, and had only been there a few years when orders were received from England by the authorities in Sydney to deport all the Norfolk Island settlers to Tasmania, and adequately compensate them for the loss they must sustain through the compulsory abandonment of their farms. Mr Devereux, sen, came to Tasmania shortly after that – in the year 1808. Most of Norfolk Islander settlers were granted lands at New Norfolk and Norfolk Plains, which places were named after the island they had left, but Mr Devereux appears to have settled at North Bridgewater, where the late Mr Phillip Devereux was born in the year 1820. When little more than a lad, Mr Phillip Devereux worked on the Orielton estate, then the property of Lieut. Edward Lord, who, on the death of Governor Collins, became for a time the Governor of this colony. It is worthy of note that seventy years later, when the Orielton estate was cut up and sub-divided, Mr Devereux purchased a large portion of the property on which his earliest working days were spent and with his characteristic energy, at once proceeded to clear and improve the property, and even to lay out upon it an orchard, a return from which he himself could never expect to see. In 1847 he settled in the Huon district, where he remained for a long period of sixty years. More than thirty years ago a relative of Mr Devereux died in Sydney, leaving a very considerable estate, to a large proportion of which he became entitled. Mr Devereux made a wise use of the money which had so fortunately reached his hands, laying out very considerable sums in taking up and clearing land, and planting out orchards in the district of Port Cygnet, where he had made his home. All through his long life he was a great worker, and few Tasmanians in their allotted span can have done more to clear the forests of timber and bring under cultivation the waste portions of their Island home. He was a man of sterling integrity and honour, and was looked up to and respected by all those about the populous district in which he had passed so many years of his long and useful life. Mr Devereux has left a large family, many of whom he lived to see settled and prosperous on farms in the Port Cygnet district. From these articles, I learned that Papa McCarthy, 1788 Marine, had died in Melbourne. He seems to have moved around quite a bit, being apparently footloose and fancy free. It is documented that in the 1820s he was Chief Constable on the Windsor Road (NSW). Now this is where the Real Wild Colonial Boy, Bold Jack Donahoe, was plying his highwayman trade in the surrounding hills. Donahoe or O’Donahoe was born in Castlemaine, Co. Kerry, Ireland, the same county as Papa McCarthy. So I was very distressed to read that Donahoe was taken on the order of McCarthy, who had obviously issued the warrant and who, at this time, would have been getting on in years and because of his military background, he apparently just sat there and sent the troopers out. He was certainly not in the posse of horse-police led by Sergeant Hodson. Trooper Muggleston shot Donahoe through the jaws as the song says, but otherwise the truth has been vandalised by putting the Wild Colonial Boy into a Victorian setting. It may have been changed to overcome the fact that, after Donahoe’s death, the song had such an evil influence in the Colony that its singing was banned in public houses on pain of loss of licence. O’Donahoe earned that title Bold because he did most of his marauding on foot and was cheeky enough to make his victims change clothes with him. A First Fleeter – We have today to record the now unusual occurrence of the death of a ‘First Fleeter’, an old man named McCarthy, upwards of 100 years of age, who arrived in the colony in the capacity of a sergeant of marines, with the first detachment sent out from England, for the purpose of establishing a settlement at Botany Bay. McCarthy removed from Sydney to Norfolk Island on the formation of a settlement there, and on its being broken up he accompanied the other settlers to Van Diemen’s Land, and had, consequently, the rare distinction of being among the first settlers of both colonies. The old man passed his 100th year at Christmas last, but up to the time of his death he betrayed few of the failings of age, being able to read the smallest print without the use of spectacles, and retaining the full possession of his faculties until within ten minutes of his death, which did not take him by surprise, for he remarked, on going to his bed a short time before, that he was going to lie down and die. McCarthy died on Friday last, at the residence of Mr WH Budd, Kinlochewe, who married his great-grand-daughter, and with whom he has been living for nearly eight years. So Papa McCarthy had a Geelong connection. The WH Budd, of Kinlochewe, was the Wm. Budd who had the Ashby Inn in Britannia Street from 1840-45 when there was a recession and he sold up and went to the Inn at Kinlochewe, where there would have been more customers from the passing trade on the Sydney Road. So it seems Papa McCarthy would have been living in Geelong from 1840-45 as he came over from Van Diemen’s Land on 1 November 1839. I attended St Patrick’s School in Britannia Street in the 1940s, so exactly 100 years earlier our First Fleet ancestor would no doubt have trodden on that very same ground! Only for Wm. Budd moving to Kinlochewe, Papa McCarthy would have died in Geelong and I have been able to locate his grave. I have been unable to do so up to the present. However, the mystery of the considerable inheritance that my great grandfather, Phillip Devereux and his brother Peter received from Sydney in the 1880s is still unsolved. There is, I am told, a very historic farm in the Penrith area (NSW) called McCarthy’s Farm. Could it have come from there? My own personal feeling is that it was money that John Devereux, the Irish rebel, had coming to him from Irish estates and by the 1880s he was most certainly deceased, and so his two surviving sons laid claim to it. It was more money than any relative in Australia (and they were very thin on the ground) could have accumulated. I am very proud of my ancestors, who, despite living in a very harsh time, prospered and survived to grand old age, which, perhaps, has something to do with their respective family mottoes. The Devereux family motto being Constancy the Base of Virtue, while the McCarthy motto is To the strong and faithful, nothing difficult.